This is a compilation of our volunteering efforts, some, not all, thus far in 2016. At Peninsula Federal Credit Union, we are all about Sharing the Love! Charitable acts are a BIG part of who we are. Being a Credit Union, strong community involvement is in our roots and it is something we strive to uphold. Our goal is to be THE trusted financial partner in our community. By showing support for our local organizations, schools, events and most importantly, the people, allows us to be just that. Annually, PFCU participates in community walks, sponsors local Little League teams, beautification projects, supports their area schools in back to school fairs and even coordinates in the classroom financial education. Since January PFCU employees have spent over 600 hours volunteering in their communities and the Credit Union has donated upwards of $19,000 to local charities, benefits, members, and organizations. Please vote for Peninsula Federal Credit Union and help us to continue to Share the Love! Kellogg Community Credit Union's commitment to the community extends far beyond the financial services we provide for our members. We truly care about our community and the people who are a part of it. We aim to give back through service, volunteerism, charitable fund-raising and random acts of kindness. We believe that together we can make a difference in the communities we call home. World Class Schools of Leon County Inc.
At Envision Credit Union, supporting education has been our primary focus for more than 60 years. Through various initiatives designed with our local communities in mind, we are able to support the school system year-round. By banking with Envision, members not only receive the best in financial products and services, but also contribute to our giveback efforts to local schools. Help us share the love for education! Thank you for voting. Sadly, in the next 34 seconds someone will have a heart attack. In the next 60 seconds someone will die from heart disease and 50% of the time its sudden cardiac arrest - no time to say you're sorry, no time to say I love you, no time to say goodbye. Catholic Federal Credit Union cares about our community's health and loved partnering with Pulse3 Foundation for their Run for Your Heart Community Races. Pulse3 helps the community discover healthier ways of living, by providing free health screenings, reaching at-risk children annually, conducting health conferences, donating Automated External Defibrillators (AED) & free CPR training, releasing a phone app that links people trained in CPR to 9-1-1 responses among many other initiatives. WE CARE ABOUT OUR COMMUNITY Fueled by the philosophy of �People Helping People,� Post Community Credit Union supports the communities we serve and enthusiastically donate thousands of dollars each year to many worthy organizations through our community donations committees, Credit Union sponsorship budget, and High School Scholarships. We embrace the spirit of giving throughout the year by volunteering and raising funds to help support creative projects and innovative technologies that enrich the lives of our local youth, and with programs that provide food, clothing, holiday gifts, and financial assistance to local families in need. By voting for us daily, it will give us the opportunity to donate $15,000 to S.A.F.E Place Shelter to support our community. Zeal Credit Union is dedicated to bringing awareness to the homeless population in Michigan. Members of our staff recently went to Campus Martius in Detroit to bring awareness to homelessness, and to hand out blankets and other warm weather supplies to help people in need during the cold winter season. Trius Federal Credit Union members and staff support Children's Hospital and Medical Center a Children's Miracle Network Hospital. The video describes some of the many activities that we do each year to raise money. Help us help children by voting for our video. Northeast Community Credit Union enjoys being a part of their community. Their efforts are seen through the schools, business and local events for non-profits. Not only do they participate in the community, but they offer programs and specials to help their members and community members with any type of financial need they might have. NCCU gives of their time and money, but the employees do as well. The employees volunteer throughout the community and attend events in the credit union's name. The employees also donate money on Fridays to wear jeans, and throughout the year the money is donated to various members and organizations that may be in need. Anyone who works for NCCU is proud to be a part of the credit union and the community they serve. VOTE NCCU for Share the Love 2016! Because of our credit union model, we're able to give back to make a difference. One of the ways we do this is by providing financial education through personalized programming, like our School $ense and Smart Connection programs. Watch our video to learn how we're positively impacting the lives we touch through these programs! Vote for Royal so that we can help Mentoring Young Adults (MYA) in St. Paul, MN. MYA is "focused on disrupting poverty and inequality in the communities it serves within the population of Ramsey, Washington, Dakota and Hennepin (youth services only) counties. MYA positively impacts the community with programs focused on helping young adults in initial crisis situations with training, counseling and group support." This organization is all about positively impacting their communities! "MYA is a community crisis management organization for vulnerable youths seeking to close the gap on education achievement, truancy, unemployment, homelessness, the disproportionate rate of minorities in the criminal justice system and the lack of competitive skills essential to sustain a positive, healthy and successful lifestyle." Vote for Royal Credit Union to support the good work of Mentoring Young Adults in the greater St. Paul area. Adventure Credit Union is honored to partner with Ele's Place to help grieving children heal. Adventure Credit Union and its employees take pride in knowing that their donation from jean days, bake sales, sponsorship's, and volunteering their time all goes to help children that have lost a loved one. To date, we have donated over $18,000 to Ele's Place. Serving our community goes beyond meeting the financial needs of our members. From our humble beginnings in a church basement, we have grown on the idea of people helping people. Check out our video to see how we are all ONE community. At One Detroit Credit Union we help people in our community who have been overlooked by the mainstream banking system by providing them with credible, fair and reasonably priced financial products and services. As other financial institutions fled Detroit, we expanded our scope to help fill the financial services gap. Though we have never forgotten our roots, we have grown to include all people in our mission. Whether you live in the city or the suburbs�we know you carry the Spirit of Detroit with you�just as we do. We are One Detroit. One of the core values and philosophies of the credit union movement is to help spread financial awareness to everyone. As a credit union, we have been fortunate to "Share the Love" with our community in so many ways, including; its students and several schools over the years. We understand that a financially savvy youth helps propel the future of our leaders, communities, and businesses into a robust economy. Everyone can benefit from financial wisdom. Therefore, COPOCO Community Credit Union has elected to support Junior Achievement of North Central Michigan. Junior Achievement's purpose is to inspire and prepare young people to succeed in a global economy and to own their economic success. The funds raised would help to advance JA programs to support more than 17,000 students throughout the Great Lakes Bay Region. So help us, "Share the Love" by voting for COPOCO CCU's video to help continue to educate our youth to be thrifty consumers! It's what we do, here, at COPOCO CCU - Helping each member realize their financial goals and dreams since 1951. GCS Credit Union believes a Random Act of Kindness can go a long way. In 2016, GCS Credit Union partnered with 102.5 KEZK to create the #GCSRAKs program (RAKs = Random Acts of Kindness). The mission behind #GCSRAKs is the credit union philosophy... People Helping People. You never know what the person next to you is struggling with and a small act of kindness can go a long way. #GCSRAKs have included everything from paying for gas and groceries to giving children with cancer a VIP red carpet experience. Vote to help GCS Credit Union continue to pay it forward. If GCS Credit Union wins this contest, GCS will be paying it forward by donating gifts to Toys for Tots during the holiday season! Through our Fox Communities Cares Foundation and the support of many Fox Communities Credit Union staff, volunteers, and our communities, we were able to organize and pull off a very successful and true, one-of-a-kind biking and music event! This inaugural event, Bike to the Beat 2016, raised a whopping $25,000! 100% of the proceeds profited myTEAM TRIUMPH's mission to provide a team building support system for people with disabilities through athletics. Bike to the Beat is just one of many community events Fox Communities Credit Union organizes to help change lives in the Fox Cities. Through the support of events like these, Fox demonstrates what credit unions really are all about: people helping people. We hope to be able to share even more love with other organizations who are important to our community. For us, serving our community stretches far beyond simply meeting the financial needs of our members and non-members. We are passionate about the East End, its growth, and its progress. This community has been our home since 1965 and we are honored to give back to it in any way we can. Covenant Kids is responsible for improving care for Covenant Hospital's littlest patients. They do this by raising funds so that much needed equipment and resources can be acquired to save the young lives of children all over Michigan, that need that extra special care. Please help by voting for Frankenmuth Credit Union's video to help save more tiny lives. At Notre Dame Federal Credit Union, we believe we can all do our part to empower young people. With our internship program, we strive to support the youth in our community and build future leaders for tomorrow. Our video shows the different ways we have given back to the communities we serve. One of the areas that Educators Credit Union focuses on is financial education. This video discusses two different programs they are a part of that help ensure the next generation is as financially informed as possible. REGIONAL federal credit union has supported the Food Bank of Northwest Indiana for over ten years, with team members volunteering, participating in annual events, and raising funds. The credit union's efforts have helped provide tens of thousands of meals for families in Northwest Indiana. Member Driven, Community Focused for Kids Food Basket of Muskegon! Service 1 Federal Credit Union strives to live its mission: Member Driven. Community Focused. Food drives, restoration and cleanup projects, and involvement with shelters are just a few of the ways we partner with area organizations to focus on being a part of the solution in our communities. Click on our video to see some of the organizations we've had the privilege of serving, and experience the great work of our chosen charity, Kids Food Basket of Muskegon (MI). The organization supplies �Sack Suppers" to at-risk elementary children: take-home evening meals that provide a well-rounded, nutritious meal�nutrition that�s critical to the development of healthy bodies and strong minds, helping to curb food insecurity and keep kids nourished so they can focus and flourish at school. Thank you for voting! A brief glimpse into all the ways Bayer Heritage FCU stays involved in our communities. It's all about F.A.M.I.L.Y. - Fun, Appreciative, Motivated, Involved, Loyal and You! In 2016 our Community Connections Team participated in many events that helped us connect to our communities and that paid tribute to organizations that are near and dear to us. The organization that is closest to our hearts is the American Cancer Society and we dedicate this video to all of our loved ones that we have lost to this terrible disease. "Giving back to the community is a core value at Michigan State University Federal Credit Union, and each year MSUFCU's Charity Committee selects a local organization to support. This year, we were proud to partner with Small Talk Children's Assessment Center. In Michigan, Ingham County experiences more than double the cases in comparison to other counties. Small Talk is a 501(c)(3) non-profit that makes it easier for kids to talk to police, prosecutors, and Child Protective Services in a more comfortable, kid-friendly environment.This organization is vital for our community because they help to give children the strength to share their experiences against all odds with the resources to heal, find empowerment, and thrive." What is more American than the desire to do better? At PenFed we have an unwavering mission to help Americans do better. We�ve opened our doors to people from every walk of life who share our commitment to reaching the goals they set. Personal goals. Family goals. Financial goals. We must empower and educate. Visit PenFed.org to learn more. Federally insured by the NCUA. Point West Credit Union loves our community! Watch as we highlight just one of the many charities we support throughout the Portland area. Through bowling! Forest Area Federal Credit Union focuses on member benefits, education and community support. FreeStar Financial Credit Union, a military based credit union since 1957, is a proud supporter of Pets for Vets of Southeast Michigan. In this video we visit the home of one of the recipients of a Pets for Vets Companion Dog. For the third consecutive year, DuPage Credit Union has partnered with the DuPage Regional Office of Education to give children in need a backpack filled with essential school supplies. The Credit Union's We've Got Your Back campaign has raised over $40,000 since its inception. And last year DuPage Credit Union was awarded a Dora Maxwell Social Responsibility Community Service Award for this initiative. We appreciate your vote to help us help more children in 2017. At MCCU, we offer more than just financial products and services. we are an organization with a heart for our community. In over 65 years of service, we have become an integral part of the local community. We care, because we live and work here too! At Advia our mission is to provide financial advantages. Education is one of our top priorities and we believe our local school children should have the tools they need to learn and succeed in the classroom. Because many of our schools serve a large number of low-income families, in mid-summer we kicked off a two-week School Supply Drive to benefit area schools and students. Our team of 400 staff and 130,000 credit union members responded by donating highlighters, colored pencils, bright pink backpacks and more to our 26 branch locations in Michigan, Wisconsin and Illinois. Branch managers delivered the supplies to area schools and as one appreciative teacher told us, "It really does take a community to raise a child." Clinchfield Federal Credit Union's "Big Love for Community"
Our small town credit union has a big love for our community! We have a strong commitment to Relay for Life, enjoy being involved with all the children and teens who will hopefully mature into CFCU members, and treasure the moments when we can help our members, one by one. The community involvement team at Mutual 1st Federal is an employee-ran group, passionate about our community. Every year employees vote on quarterly charities to partner with in order to improve the quality of life for residents in our community. We have proudly partnered with ALS in the Heartland since 2004 in their mission to support local ALS patients, and hoping for a cure! Community is something we strongly believe in here at Mutual 1st Federal but the word means something different to everyone. What does community mean to you? 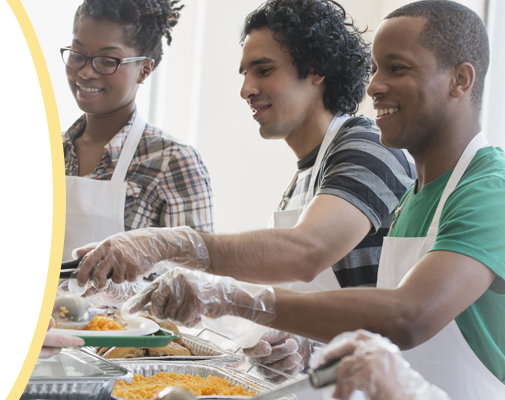 NorthStar Credit Union is committed to making a difference in the communities we serve. We choose to get involved, not because we have to, but because we believe it is the right thing to do. For 4 years Settlers FCU has put on a the "Knock Out Cancer Walk" raising over $16,000 for the Ontonagon County Cancer Association. We are proud to support the great work this center does for our community. Gerber Federal Credit Union strongly believes in the "people helping people" philosophy and works to give back by utilizing a variety of outlets throughout each year. Whether it be educating children of all ages on the importance of financial literacy, volunteering at Relay for Life, raising money for charitable organizations, or giving back through giveaways and collegiate scholarships - we are committed to our community and helping others in every way that we can. Giving Back Goes Down to our Roots. GKCU is a community-chartered credit union started in 1952 for families in Georgetown and Williamsburg Counties, SC. From it's deep roots in the community, being part of the community became a blooming asset. GKCU serves 4 different communities with a population that ranges from low-income to the affluent - but the common ground we all agree on is making our home the best it can be for EVERYBODY. While March of Dimes is our biggest focus for fundraising in a year, our TEAM continues to find diverse ways for us to give back more than just financial. We volunteer to read, to come up with new ways to understand math (STEM), to support youth athletics, summer study programs, civic organizations and of course, our members well-being too. We donate annually over $35,000 to area charities and are excited what each year holds. Thank you for taking time to recognize these efforts that mean so much to the success of a community! The Family Access Network improves the lives of nearly 10,000 children and family members each year. Dedicated FAN advocates in each school work directly with students to provide a connection to vital resources- keeping them healthy and in school. As a credit Union founded by educators, Mid Oregon joins FAN in helping every child get off to a great start. Abbey Credit Union formed in 1937 has a long history of bringing out the best in ourselves and others. Each year, we challenge ourselves to be our absolute best at conducting community events - thanks to the tireless support of our employees, board members and local businesses. Individuals belonging to Abbey are not just customers, they are members of an organization that truly cares about their needs and their community. A good education and nutrition is vital to bringing out the best in our kids. We sponsored schools by donating school supplies for local students to provide the opportunity to bring out the best in our kids and ourselves As a not-for-profit organization, our goal is to back the financial stability of the community by offering convenient savings plans and quick sources of credit. Over 100 organizations in Vandalia, Butler Township, and Miami County offer Abbey's services to their employees at no cost to the company. Abbey is owned and operated by people within the same community. People you can trust. Every year since 2000 we held fundraiser events raising over $10,000 � benefitting The Dayton Children's Hospital. We're a hard-working group of community-minded people trying to leave a positive footprint. To celebrate Childhood Cancer Awareness month, the employees of Cornerstone Community Financial partnered with Children's Hospital of Michigan to hold a Teddy Bear Drive to brighten the lives of childhood cancer patients and their families. Six branch locations served as drop-off locations for teddy bears and donations during the month of September. Employees, members and local communities contributed enough bears to handout to 500 children during their stay with CHM. Among our community organizations we sponsor, United Bay Community Credit Union is proud to support the MYLead program. MYLead is a weekend long conference for high school sophomores from the state of Michigan that promotes leadership and gives them the tools to make a positive impact on their communities. Here's to 75 more years of giving back to the community we love! Each year Bronco prides itself on giving back to our local community. In 2015 the projects that this video highlights shows that our members and staff came together to donate over 7,200 pounds of food, 1000 packages of school supplies, a truck load of toys for children in the hospital at the holidays, and almost $50,000 for our local children's hospital and local students. Bronco loves and appreciates our community and is happy to serve the area that supports us! American Heritage has been devoted to helping the community in a unique way. Through the Children's Hospital of Philadelphia, American Heritage founded the Kids-N-Hope Foundation in 1996, a music therapy program that allows patients to express themselves while overcoming their illnesses and injuries through the power of music. Annual events throughout the year brings together American Heritage employees, members and the surrounding communities to raise money for this organization. Whether it is sliding into 700 gallons of strawberry gelatin or perusing antique cars, these events not only allow American Heritage to show its love for its Greater Philadelphia community, but they bring awareness to the challenges children face while living with life threatening illnesses and injuries. SageLink Credit Union loves to be involved in the community! Anything that will help our neighbors is a great way to spend the day! Leyden Credit Union is all about helping those in the community. This member-owned financial institution awards scholarships and grants, sponsors a community charity, provides free services to civic groups, works with the local chambers of commerce, and supports the park districts. The Associated Credit Union Foundation worked with Wilderness Works - an Atlanta youth development agency serving homeless and disadvantaged children - to send 25 kids to summer camp. Wilderness Works provides needy Atlanta children mentoring, experiential education and enrichment programs. Each year the children participate in an unforgettable summer camp experience that they are literally crying to leave. The ACU Foundation is honored to work with Wilderness Works on helping to enrich and positively change the lives of these children. Genisys Credit Union is committed to Making a Difference. The Food Bank of Eastern Michigan has been helping with the disaster in Flint, Michigan by distributing millions of water bottles. Now, they are in need of lead-fighting foods. Genisys is asking YOU to help us help the Food Bank of Eastern Michigan. We realize at our credit union that to share the love and really spread the message, we need to start within. We need to inspire by example and share the kind words we have in our heart. Casco Federal Credit Union believes in helping its community by empowering people to be financially well! By partnering with the CA$H coalition of Greater Portland, (hosted by Goodwill NNE) Casco Federal Credit Union is able to volunteer during tax season to provide free tax preparation for community members. CA$H Maine helps to ensure that all community members receive their full tax refund. It's an extremely rewarding way to give back to our community! Every year, UT Federal Credit Union collects donation items for families spending the Thanksgiving holiday in the hospital with their children. These items include everything from non-perishable food items, to hygiene items and activities. Once all donations are collected from staff and members, the items are placed in baskets and delivered to East Tennessee Children's Hospital and UT Medical Center (NICU) in Knoxville, Tennessee. We are raising money for the Ronald McDonald House Charities of Knoxville, so that other families spending time at the hospital can benefit as well. Each year, the Community Choice Foundation awards 20 of Michigan's best and brightest students with scholarships to recognize their academic achievement and commitment to their communities through active community service. To date, the foundation has awarded over $800,000 in scholarships to Michigan students and with your help, we can give even more. Sabattus Regional Credit Union focuses fundraising efforts on Maine Credit Unions' Campaign for Ending Hunger. The credit union raises money to distribute to local hunger organizations and food pantries. Alabama Credit Union created the Secret Meals For Hungry Children program in 2008 with one goal in mind - decreasing the number of children in Alabama facing hunger over the weekend. That commitment has never been stronger. Currently approximately 2,500 students are receiving Secret Meals food packs across the state of Alabama and Northwest Florida. To date, no school has been denied a request to increase the number of children enrolled in the program. Alabama Credit Union employees have accepted the challenge to raise $140 (on average) to provide a weekend food pack to each child, identified as going hungry, for an entire school year. "Fire Family Foundation responds with compassion when tragedy affects firefighters and fire victims." A nonprofit founded by the respected Firefighters First Credit Union, Fire Family Foundation offers immediate assistance to firefighters and their families, fire victims, fire departments, and charities. The Foundation believes that by coming together as a "Fire Family," assistance can be provided to those impacted by fire. Hope, Strength & Joy: Since 1996, Triangle Credit Union, its members, and the New Hampshire Credit Unions have donated over $2.1 million. With the hope to grant wishes for all New Hampshire children living with life-threatening medical conditions, together we are shooting for the stars. Hughes Federal Credit Union believes in giving back to the community we serve. Every year we help numerous organizations with financial support, giveaway items, adult and youth education, and more. Since January 2015 we have provided more than $130,000 in support to over 100 different organizations. Like Hughes, the University of Arizona Foundation is dedicated to creating a stronger community by empowering our youth through various programs like The Take Charge Cats, a team of student ambassadors who educate Tucson high school students on personal finance. The �People Helping People� philosophy is not just illustrious in our own service mission but in the UA Foundation�s as well. The Interior Federal Credit Union has committed to be the natural resource for financial needs since 1935. In doing so, we regularly stretch beyond the credit union walls to partner with our local government, sponsor, members, and organizations for community service opportunities. In 2013, we created a voluntary in-house philanthropic committee. 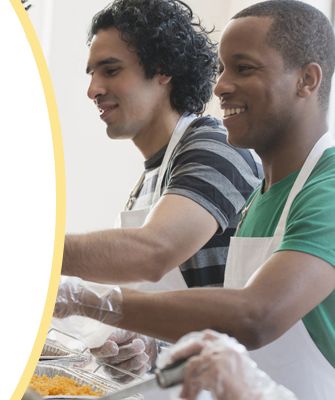 The committee�s goal is to connect with the community every month to give back to those we serve, in their environment. Since then, we've connected over 200 volunteers, to 66 events, that contributed over 960 volunteer hours. This is how we share the love. Community West Credit Union located in West Michigan is a proud supporter of Kids Food Basket. Kids Food Basket provides nutritious sack lunches and suppers for tens of thousands of kids that are battling childhood hunger. Please vote and help us support this awe-inspiring organization so they can continue their fight against childhood hunger. A 10 year longtime partnership between Dakotaland Federal Credit Union and our 4-legged friends at the Beadle County Humane Society Turning cupcakes and cookies into cash for the continued operation and growth of this volunteer based, non-profit organization. FSCU - On an "Island" by themselves! This video highlights the Money Island Financial Literacy program that was set up in 2012. We hired a retired teacher of 37 years to help get our program in 7th-grade middle schools and 9th-grade high schools in Etowah County, AL. Family Savings as of October 2016 will have taught over 8,000 children and donated over $11,000 to local schools through our financial education program. We are pleased to present our video in hopes that we will be able to further our efforts helping young people of Etowah County Alabama through our local United Way. .
Merrimack Valley Credit Union has been keeping our community's best interess at heart for more than 60 years. We do this both by bringing the community inside our walls, and helping organizations in our surrounding towns. MVCU has worked with Class, Inc. to bring Roseanna in to work in our mail room. Roseanna is able to acquire job skills, while the Credit Union benefits from her dedication and hard work. In the community, we are dedicated to the fight against homelessness in the Merrimack Valley. By supporting Emmaus, Inc. and dedicating a significant portion of our charitable efforts to this organization, we are committed to helping more men, women, and families are receiving the resources they need to find sustainable housing. Additionally, we support more than 30 organizations per year with charitable donations. Limited school budgets and funding prohibit many schools from being able to update or repair school grounds and facilities as needed... Wouldn't it be great if someone provided the resources to give schools a "makeover" Georgia United School Crashers program provides much needed school facility improvements to enhance the learning environment for students each year. Hundreds of schools apply with why their school deserves a facilities improvement project. The grand prize winner and five runners up received projects ranging from media center makeovers to special needs playground equipment. This year's School Crashers top winner was Oakcliff Elementary School in Doraville, GA, a diverse Title 1 school. Their facilities makeover was July 22 & 23 and included interior & exterior paint; numerous murals; 24 new cafeteria tables with seating; landscaping; carpeting; playground improvements & more. Each year, NEFCU participates and supports the Spring Games for Special Olympics of Long Island, NY. Our staff is intimately involved with providing support for the games. This year, over 600 athletes took part in the athletic competition, demonstrating their skills and courage while also sharing their gifts with the community. North Central Area Credit Union and Michigan State Police District 7 team up to support local veterans through the Mid-Michigan Honor Flight. In the 1960s more than 50,000 widows of enlisted airmen were living in poverty. Low pay and frequent moves left many military spouses without careers, without retirement plans and without significant assets. The Air Force Enlisted Village provides surviving spouses with a safe, secure home where they can live among their peers in a supportive environment, without the stigma of subsidized housing. Eglin Federal Credit Union has partnered with the Air Force Enlisted Village for the Chief Master Sergeant of the Air Force James C. Binnicker Memorial 9k and Fun Run, a major fundraiser for the Air Force Enlisted Village. In 2016, 320 people participated, raising more than $23,000 dollars for the Air Force Enlisted Village. IBMSECU's South Florida branches first partnered with the 365 Food Drive of Broward County in April 2016. In just a couple of weeks, the Credit Union was able to collect 300 pounds of food, much of it coming from our employees. This is a perfect example of what makes credit unions such an important part of our local communities. CoVantage Credit Union had the opportunity to partner with another local business to sponsor a long-running race called the Antigo Tater Trot in 2010. While at first it may seem like a credit union and a 10k race wouldn't be a great fit, the community soon realized that the Tater Trot, like the credit union, had a similar mission: to serve the community. In 2016, CoVantage launched the CoVantage Cares Foundation to provide funds to organizations that provide assistance to individuals, especially those experiencing significant financial challenge, and to organizations working to enhance the quality of life of residents living in the communities served by CoVantage Credit Union. Community involvement is very important to the staff at Astera Credit Union. This video showcases just a few of the many events and activities we have done throughout 2016 to support our local community. DuTrac Community Credit Union has been serving its members for 70 years. At DuTrac, we are committed to our members and giving back in the communities we serve. In honor of DuTrac's 70th anniversary, we asked our members why they love DuTrac and these are a few of the responses we received. Year after year, Glass City Federal Credit Union assists numerous non-profit area organizations through employee and member participation and donations. This video highlights community outreach efforts completed by Glass City Federal over the past year. "Carson's Crew and Kennedy, too!" (CCKT) was founded as an organization to help raise awareness about Cystic Fibrosis and money to help fund research for a cure. The crew is a group of Carson and Kennedy's family and friends who work year round in this effort. All money raised by CCKT goes directly to The Cystic Fibrosis Foundation. Carson and Kennedy are the grandchildren of Glass City's President and CEO, Mark Slates. Although Glass City partners with numerous area non-profit organizations, the employee base is most passionate about the CCKT organization and finding a cure for Cystic Fibrosis. Cystic Fibrosis is a genetic disease affecting 30,000 children and young adults in America. There are over 150 families in the Toledo area alone that are affected by this disease. CF causes chronic and life threatening lung infections and impairs digestion. The average lifespan of people with CF is 36 years...this is just not acceptable! The Cystic Fibrosis Foundation does not receive government funding for research-funds come from people like you! If you would like more information on Cystic Fibrosis please visit www.cff.org. Adults over the age of 65 are most vulnerable to mental illness such as depression and anxiety. They have to manage significant issues such as the loss of friends and significant others, health and physical problems, disability, forced isolation, and having limited financial resources. Since 1878, the Jackson Friendly Home has provided warmth, safety, and medical assistance for elderly women. Many of the ladies that come to the Friendly Home have experienced homelessness, abuse and neglect, and poor medical support. The Jackson Friendly Home bridges the gap for many of the senior women who believe they have no value. It provides residential care for 45 women who otherwise could not afford the cost of living at other senior housing programs. Many of the residents do not have frequent visitors, so when organizations like Michigan Community Credit Union come to visit, the ladies thoroughly enjoy the time they spend with them. Gatherings such as bingo nights, picnic lunches, and ice cream socials make the women feel special. It reassures them that they live in a home and a community that cares about them and their needs. Continued support of the Jackson Friendly Home will provide the necessary services for a happy and healthy life. Description: Here at Financial Plus, we believe in not just talking about making a difference, but actually going out and doing it. From animal shelters to fundraisers and community events, Financial Plus is there! With seven branches and serving thirty-four counties, we believe we have a strong platform to make a positive impact. MembersAlliance Credit Union is highlighting their employee-run 'Employee Enhancement Committee' and how they support and donate to local organizations chosen by employees. Chemo Cargo is one of those such organizations. This video includes a testimonial from the founder and president, April Kunzelman. Yoobi means �one for you, one for me.� For every Yoobi item you purchase, a Yoobi item will be donated to a classroom in need, right here in the U.S. It�s that simple! USC Credit Union partners with Yoobi to help classes that need supplies. See how your credit union membership can help a classroom in need! Care for the Community. Our Community. A look at all the community efforts supported by Sioux Empire Federal Credit Union and their staff!